Circuit boards come in many shapes, types, and sizes. Their uses are almost as vast as their different complexities. Circuit boards exist in almost any household electronic object, from TV remotes to computers and from blenders to remote-controlled cars. Many hobbyists use circuit boards to construct home electronics projects. There are several choices when it comes to circuit boards, ranging from those that are for beginner hobbyists to those that are for more advanced hobbyists. One of the simplest and easiest to construct circuits available is the breadboard circuit. The breadboard circuit makes alteration of a design extremely easy, which means it is very forgiving when it comes to making mistakes while designing the circuit. It also does not require soldering, which makes it a good choice for children or adolescents. The breadboard circuit looks like a piece of plastic with lots of holes in it. Each of these holes comprises grids. All of the grids are connected through built-in metal connections that make the circuit functional. Stripboards are also made of plastic and have holes running through the entire length of the circuit board. One side of the board consists of copper track strips. The board is permanent, as it requires soldering to function properly. Since the board has lots of holes, it can be easy to solder incorrectly or to place a component in the wrong area. This makes the circuit ideal for smaller, more compact electronic projects, rather than larger ones. Printed circuit boards (PCBs) are the most common types of circuit boards, especially for home electronics construction. Rather than leaving the placement of components up to the builder, each PCB is designed specific to a schematic diagram, making construction and soldering components easier and more obvious regarding the placement of parts. The only downside to home circuit projects that do not come pre-designed or in kits is that designing printed circuit boards at home can be a tricky process because it requires several steps, such as cutting, drilling, and using insulating materials. 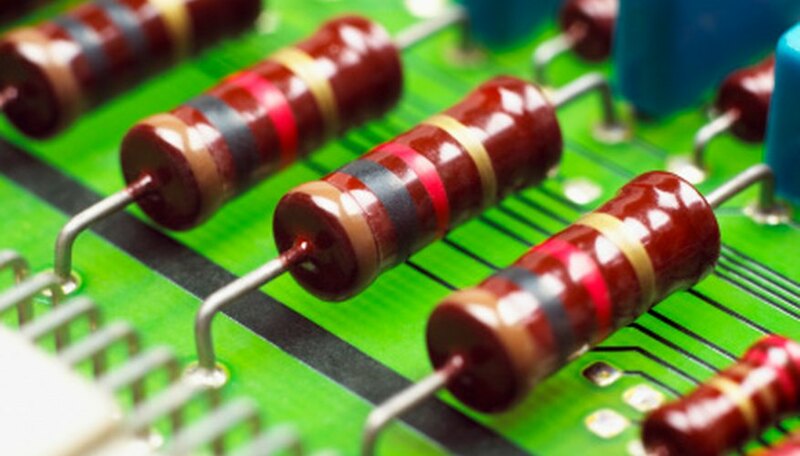 How Is a Capacitor Marked on a PC Circuit Board?